Fresh, creamy guacamole is a fan favorite appetizer, dip, even the perfect Tex Mex condiment. 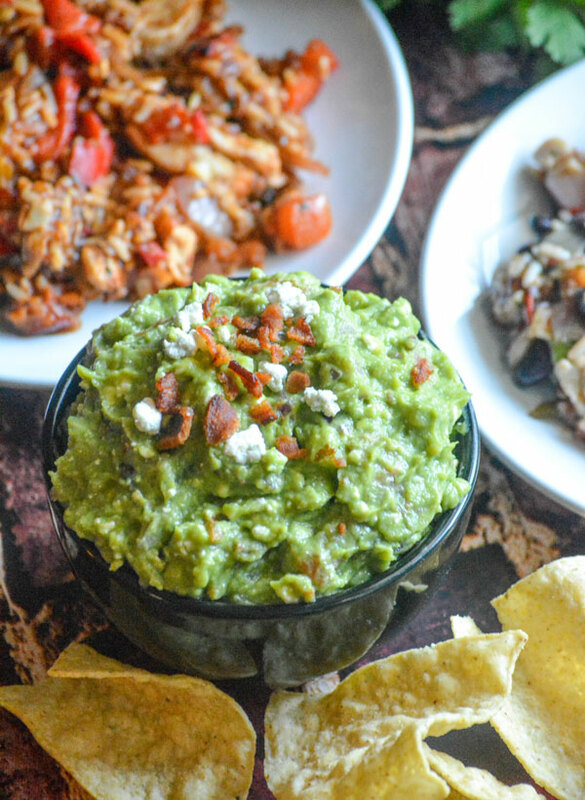 Up your game, and dress your guac to impress, by stirring in savory bacon bits and tangy blue cheese crumbles in this Bacon Blue Cheese Guacamole. School’s back in session, which means a return to hectic schedules- quadrupled if you’re in the four kids boat like we are. It’s a go, go, go- non stop kinda schedule. And most days, I don’t even mind it. I mean, a busy mind isn’t a bored mind right? Most days, I even think I have it all together. Then there are those days. You know those nights when you’re congratulating yourself for getting everyone in bed on time- bathed and with all homework done. You breathe a sight of relief; and then your stomach rumbles. You forgot to feed yourself. Don’t worry. Seriously, don’t even stress. It happens. The kids are always our top priority anyway. Forgetting about yourself though, doesn’t have to mean forgoing on a good meal. This is 2017 after all. 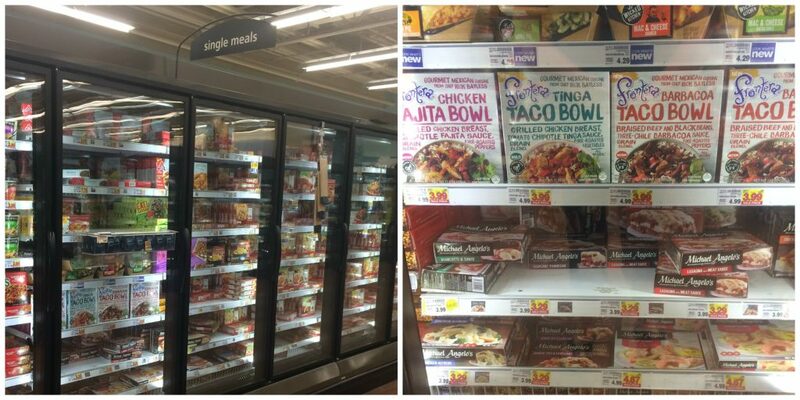 Luckily, you can still cater to yourself using a yummy frozen Frontera® meal, anytime of the day or night. If you haven’t heard of them yet, listen up friends. You can find them at your local Kroger. Here we’ve got my two favorites. 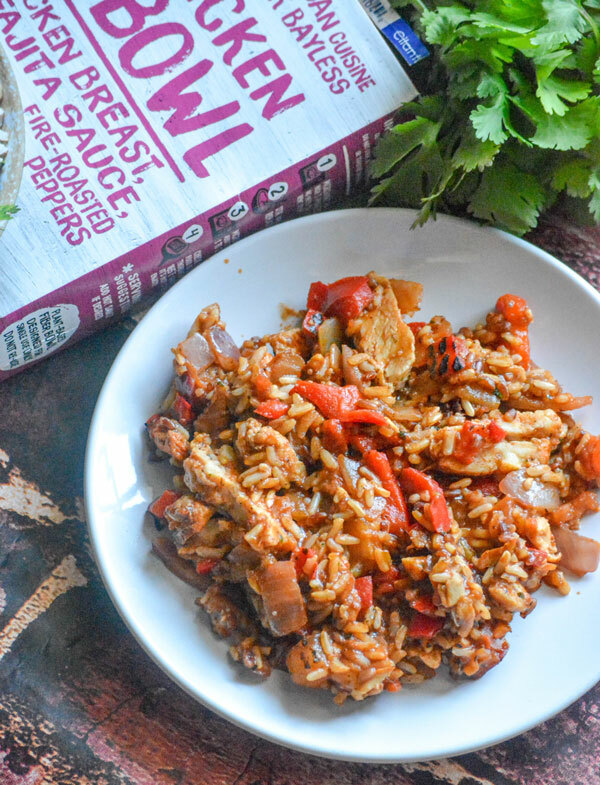 The Chicken Fajita Bowl which is made with fire-roasted poblanos and chipotle chiles. Also, the Tinga Taco Bowl, an authentic recipe from the highlands around Mexico City made with seasoned, roasted tomatoes, chipotle chile, and slow-simmered chicken. They’re delicious dishes, in a single serving size, made by an actual chef especially for you. It’s definitely something to get fired up about, even though it’s waiting for you in the frozen food aisle. 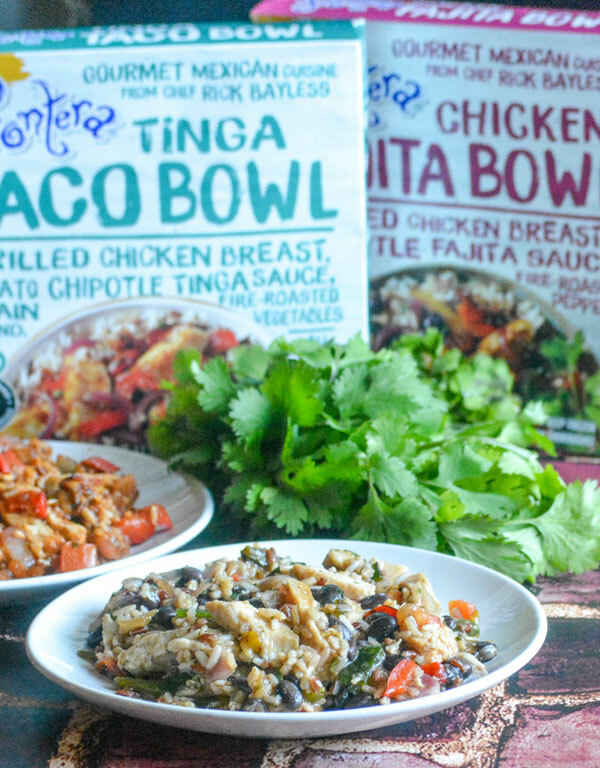 Pulled straight from the freezer, these frozen Frontera meals are the perfect thing to keep on hand. 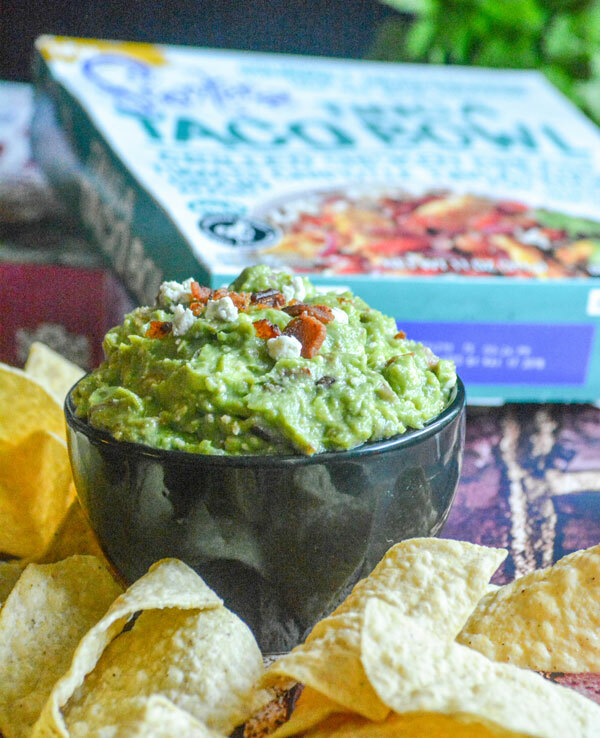 Paired with an easy Bacon Blue Cheese Guacamole, it’s the dinner you dreamed of… and the one you should reward yourself with after a hard days work! And did I mention that Bacon Bleu Cheese Guacamole? 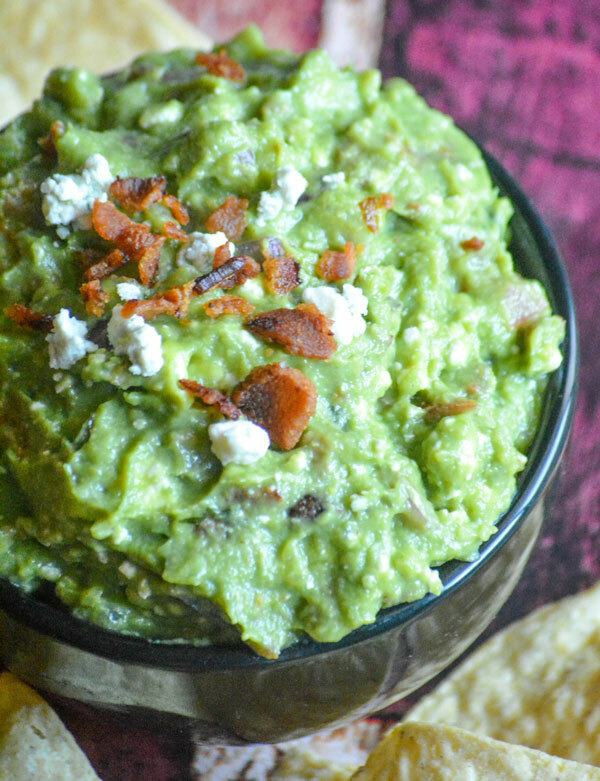 It’s the traditional blend of guacamole, but spruced up with crispy bits of bacon and tangy bits of blue cheese crumbles. It’s the perfect side dish to pair with a meal that’s bursting with flavor. It’s an experience for your palette from start to finish, and boy do we Mom’s need that from time to time. Last minute, short on time, no more excuses. Make yourself a meal worth savoring. Click here to save $1.00 on any ONE (1) Frontera meal. Download this awesome deal before it’s gone! 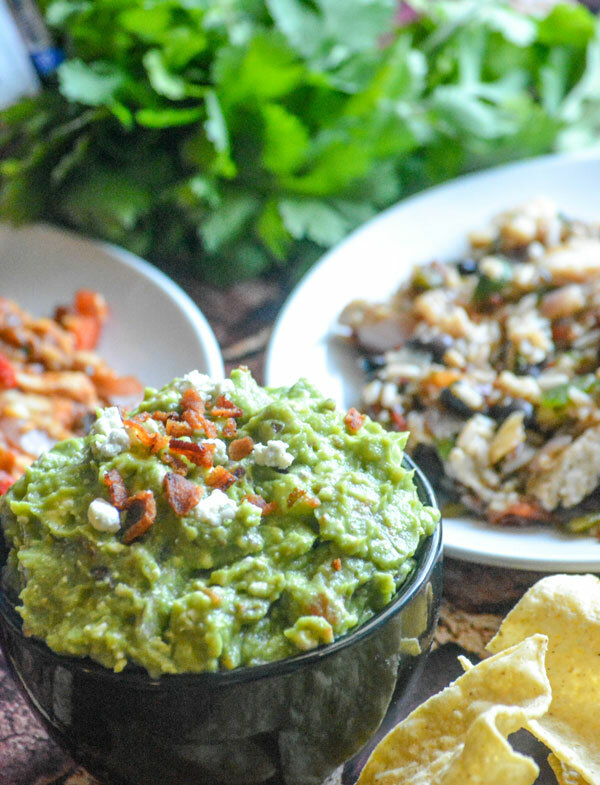 Served with a handful of tortilla chips, Bacon Blue Cheese Guacamole is the perfect side dish or condiment. It’s quick and easy, but jam-packed with fresh flavors. It’s a great way to treat yourself, to an experience not just a meal, on any time table. 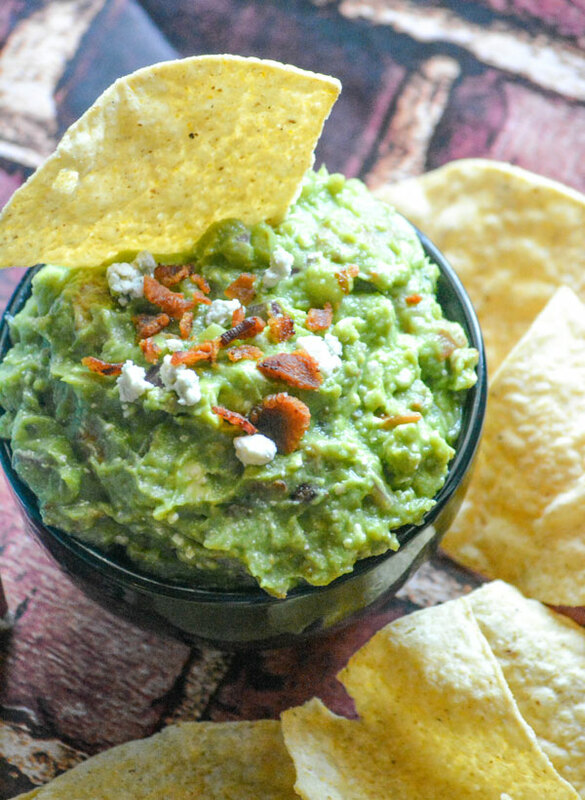 A creamy traditional guacamole dip becomes an instant party hit with the addition of crispy bits of bacon and tangy blue cheese crumbles. Cut the avocados in half. Remove the pit. Scoop the avocado into a medium sized mixing bowl. Mash the avocado, and stir until mostly smooth. Add the onion, jalapeno (if using), salt, cilantro, and cheese. Squeeze the lime juice into the bowl. Stir everything together until evenly incorporated. Stir in the bacon until the mixture's once again evenly mixed. Serve the guacamole/dip with crisp tortilla chips. Don’t wait a single second more. 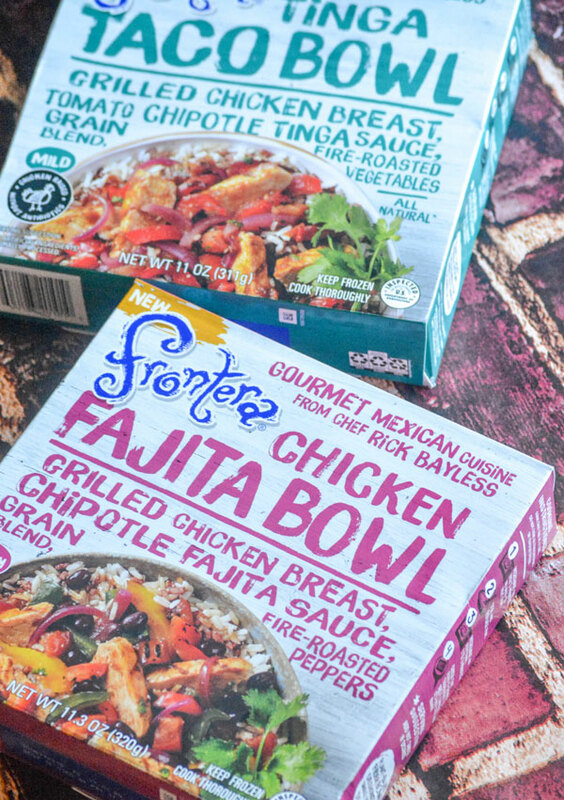 Take advantage of this awesome coupon and head on over to your local Kroger where you can find Frontera meals in the ‘single meals’ frozen food section of your local Kroger. Wow, such a cool twist on guacamole! It looks very tasty! I have forgotten to feed myself on occasion too, lol! Thanks for the delicious share over at Fiesta Friday! Certainly not your typical guacamole – but it probably needs to be called something else with the added bacon and blue cheese. I know some family who would love this version. Happy Fiesta Friday and enjoy your weekend.